If you like Walmart freebies, you will not want to miss out on this deal! Head over to Hopster coupons to claim a $2 for 1 coupon for a Simple Green Cleaning product. 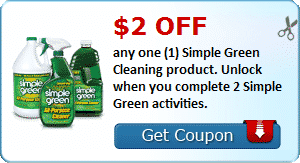 Purchase a Simple Green Cleaning product at WalMart (they are $1.97 there) and use the coupon. With the coupon, you will get your FREE Simple Green Cleaner product.